It was a head-scratching loss for the Cowboys faithful, and even one of the franchise’s legends is still wondering how Dallas blew a 23-point halftime lead against Green Bay on Sunday. 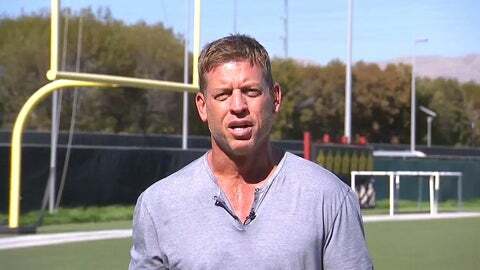 Former Cowboys quarterback and current FOX NFL analyst Troy Aikman witnessed the second-half meltdown at AT&T Stadium. "They were about to run Green Bay right out of the stadium," he said on KTCK-AM this week. "The philosophy has always been you throw the ball early in games to build the lead, you run the ball late to win games. And I believe in that. That’s the way we did it in the ’90s. I think, by and large, that’s the way Jason Garrett would prefer to do it." In case you forget, coach Garrett was a backup quarterback on the Cowboys’ 1993 and 1995 Super Bowl winning teams. "But if there was ever a time that DeMarco Murray should have had 25 carries in a game, that was it," Aikman said. "You’ve got a 23-point lead. And as it turns out, Eddie Lacy ran the ball almost twice as much as DeMarco Murray in the second half of that ballgame, which is pretty mind-boggling." Murray rushed for 134 yards and a touchdown, but just seven of his 18 carries came in the second half. Aikman has seen many games during his playing and TV career, but the Cowboys’ 37-36 defeat is one he won’t soon forget. "It was as bizarre a loss as I’ve ever witnessed."